everyone needs these, many of them. Scarily, I can say I have enough copper. Not many people can utter those words. The same thing could be said for Le Creuset, but still. Great for braising and soup making. What did I do before I started using this half sheet? Cry. I love my Cookbook Club, unfortunately the Cookbook Club schedule and mine have not collided for the past few months, and I have missed some great discussions and feasts. As luck had it, I would be home in January. In order to bring some sophistication to 2012, the powers that be decided it was time to jazz things up and have a cocktail party with fancy dresses and shoes and adult beverages.The book we chose to highlight was Gourmet Game Night by Cynthia Nims. Cynthia, a northwest native is a is a well known chef and cookbook author, with quite a portfolio of cookbooks to date. Gourmet Game Night highlights finger food, easy to assemble, eat and manage when you are holding a royal flush at your monthly poker game. The book also contains all sorts imaginative recipes come some yummy adult beverages will knock your Laboutins off, but can be adapted for the abstaining ones in your party. girly clutch, contacts and make up suitable for Vegas. I thought I cleaned up pretty well. was a cookie. The cookie was a sure thing because desserts are not always plentiful and I had all the ingredients on hand (WIN). 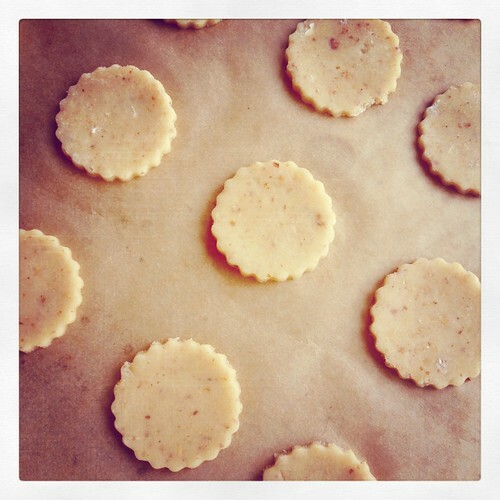 you will end up adding to your repetorie when you want something elegant, not too sweet and not chocolately. filling them and after filled store in a sealed container in the fridge and take out a 30 minutes before serving, as if they will last more than a day. Her original recipe calls for using a 2" round cookie cutter. I used my 1 1/2" and made the same amount of cookies. As long as there are two cookies per sandwich you'll be okay. Toast walnuts, Preheat oven to 300 F. Place walnuts on cookie sheet and bake until they are fragant, about 10 minutes. You don't want them to burn, but you need them to to toast enough to release some of their nutty goodness. Remove from oven and let cool. I do this by removing them from the cookie sheet and putting them on a plate, to cool faster. When they are finally cool, you can work with them. Left over toasted walnuts are delicious on oatmeal, just saying. Place walnuts and whole wheat flour into food processor fitted with metal blade and whizz until walnuts are finely chopped. Add remaining flour, confectioner's sugar, and salt and process until well blended. Add butter, egg yolks, and vanilla and pulse until well blended and if you were to stop the processor and take press the dough together it would hold together like a shortbread. Turn the dough out onto a piece of parchment or saran wrap, and press together into a flat disk. Wrap and place in fridge to chill for at least 30 minutes. 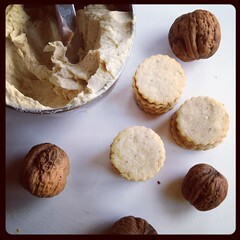 In the while, make the walnut cream. In a small bowl, place the softened butter and 1/4 cup of the sugar. Stir until combined, continue to add the sugar into the butter until well incorporated. Next stir in the finely chopped walnuts and maple syrup. The mixture should look like frosting. Refrigerate until use. Take dough out of fridge and let sit for 10 to 15 minutes to soften. Roll out dough onto a floured surface (I use parchment on a cutting board), to about 1/4". Using your cookie cutter, 1 to 1 1/2" circle, cut out circles and place onto a cookie sheet that has been lined with parchment paper. Fill up the cookie sheets with the cookie cut outs, leaving 1" between each cookie. Reform scraps of dough and refrigerate to firm up if the cookie dough has become to soft to work. Bake cookies in the middle racks of the oven for 10 minutes, or until lightly browned. I checked at 5 minutes and switched trays from the racks and turned the trays from front to back. Remove from cookie sheets onto a wire rack to cool. These cookies are very delicate - sandy like a sable, so be gentle until they cool. Continue rolling out dough and repeating process until you have used up all the dough. I ended up with another cookie sheet and about 50 cookies total. At this point, you can take your cooled cookies and place into a air tight container for a few days until you are ready to fill them. When it is time to fill them, remove filling from refrigerator and let it come to room temperature. The filling is like frosting and should be easily spread between the sable cookies. Place a grape sized amount of filling onto one cookie and then place another cookie on top and press down gently, use your finger or a napkin to smooth off the filling that may have oozed out the sides. Let sit an hour before storing.Leftovers, as if you'll have any, should be stored in an air tight container. Note: I am trying to get back into blogging. I have spent too much time wondering how people perceive me and not spending enough time not giving a whack and doing things I love. My dear Rebecca Nelson of the Ravenna Blog asked me to post a recipe for a Community Board Newsletter and while walking the dog and wracking my addled brain, this popped to mind. Coffee and gelatin, builds strong brains and hooves. This winter, I was joking with some of my Twitter friends about gelled desserts. I had posted a picture of a sublime trio of poached quince, quince jelly and shortbread from one of my favorite restaurants in London, St. John Bread and Wine. The quince was offset by a nice whipped cream and the combination of all the flavors and textures worked well together. A Twitter conversation started about Jell-O molds. It turns out that some people actually use them instead of displaying them on their kitchen walls. Imagine that. My intent was to experiment with all sorts of gelled recipes in the month of January, but like all things, life got in the way. I was able to convince TH that gelled desserts were very important and she suffered through many different experiments. My best effort was a cherry juice jelly; my worst was a green tea lemon jelly that looked like the slime we used to buy in the little green garbage cans at the toy store. 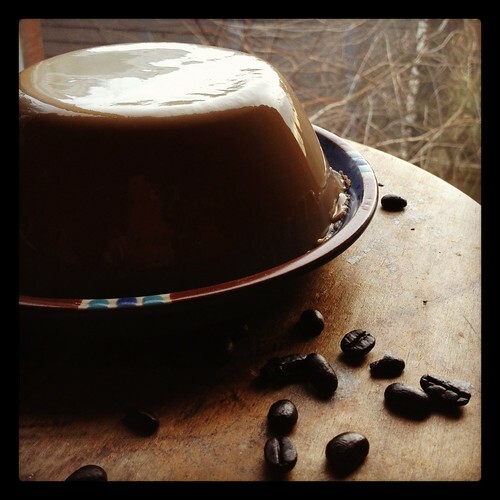 Coffee jelly is a classic New England dessert – leftover coffee is saved, when you have enough, you heat it up, add some gelatin, sugar and in a few hours, you have created a thrifty light dessert that uses up your leftovers and nothing goes to waste. Serve with some whipped cream on the side, and you can win over the most skeptical of critics. Better yet, you can use decaf and they would never know. I decided to see where else I could take this. I found a great recipe for one of my favorite drinks turned into a gelled dessert from The Food Librarian. I have enjoyed Vietnamese coffee -a sweet, strong coffee served either hot or cold when dining out, but never tried making it at home. The coffee is traditionally made using a drip filter to which sweetened condensed milk is then stirred into the coffee. It is a great substitute for dessert when dining out. It also lends itself well to gelling. The recipe is quick to make, requires very few ingredients and is sophisticated enough to serve at an elegant dinner party. Place the ½ cup of cold coffee into a 2 quart bowl. Sprinkle the gelatin over the coffee and let it sit for 10 minutes to bloom (or enlarge) before getting incorporated into a hot liquid. After gelatin has bloomed, add heated coffee to gelatin and stir in the sweetened condensed milk, stir to make sure all is dissolved. Pour into a 9x13” Pyrex (glass) baking dish, or a ceramic bowl (1 quart). Refrigerate for 4 hours or until firm. Remove from refrigerator. If in baking dish, cut into squares and serve. In a Jell-O mold or ceramic pudding basin, run a little warm water around the outside of the mold or bowl to loosen and then turn out onto a plate. Cut into serving pieces. What the heck are you waiting for? Come on down and buy some tasty treats to benefit the Emergency Feeding program of Seattle and King County. 11-2 u heights center ne 50th and univ way ne. To Hell and back via many different places, but mostly in my own zipcode. Without getting into the sordid details here, I'll do a brief recap. I thought 2009 was the worst year of my life. 2010 blew, but the first three quarters of 2011 were unbelievable. I just couldn't find words, or if I did, I couldn't even begin to express them. Its over now. I'm in a better place. I have an amazing group of friends and family. I have plans for a better future. I have a solid roof over my head, money in the bank, a healthy family, a TH who puts up with a lot of crap and a much clearer mind and heart. I have been cooking, it seems mostly the same things over and over again, with a little blip of amazingness thrown in that surprises even myself. I am trying harder. I hope you can believe in this. This weekend, I am participating in Will Bake for Food. Last year was a rip roaring success. 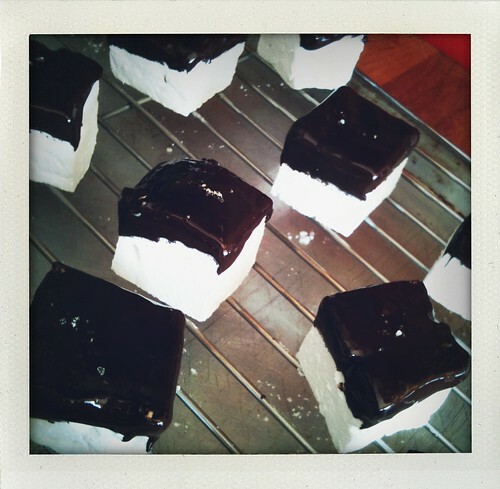 I'm going to make vanilla marshmallows dipped in 70% bittersweet chocolate and fleur de sel. They are pretty tasty on their own and would stand up to a dunk in cocoa. Come by and grab a bag or two. Pear ginger granola may make a brief appearance as well. Will Bake for Food proceeds will go to the Emergency Feeding Program of Seattle and King County. Last year the event sold out in 90 minutes. Can you believe it? I can. I am in awe of all the participants and the work that the Jennys have put into making it happen. The event is being held this year at the University Heights Center - University Way NE and NE 50th and starts at 11 am and will end at 2pm. Bring cash and non perishable canned foods (think protein people) to exchange for tickets for each item, just like the fair. Come on by. Pick up a bag of marshmallows, they might last until you get home to make some cocoa to go with them. I love pecans in most everything but pie. I know, I know. I am a heathen. Why ruin a good pecan by putting it in a gloopy mixture. I love the texture and the feel of a whole pecan half. TH swears by toasted pecan pieces mixed in with fudge sauce and coffee ice cream. I like them in chocolate chip cookies, but recently, I have been eating them candied - either by the handful or tossed in salads. They make a mighty fine hostess gift and work well with a fruit and cheese plate. They are also great candied, because they call for no unusual ingredients. You can play around with what you have lying around and they will still taste delicious. The original recipe comes from a book we bought in 1991 and whose cover has faded to a pale pink. I believe the title is "Foods from the Sun" and right now the author escapes me. All I know is that she was an editor at Southern Living and everything I have made from the book is wonderful. I'll edit this when I can get to my copy. This is the last recipe in the book and honestly, one of the best. Preheat oven to 350 F. Place pecans in a jelly roll pan and bake for 12 minutes or until the start to look toasted. Remove from oven. In a large skillet combine maple syrup, half and half and grand marnier and bring to a boil. Allow to boil for 2 minutes. Add salt, cayenne pepper, cinnamon and pecans and stir well to coat all pecan pieces. Cut a piece of parchment paper to fit the size of your jelly roll pan. Pour pecans and syrup onto jelly roll pan and bake for an additional 8-10 minutes. Remove from oven and let cool. You may have to break up the pecan pieces. If you make these often, you might find the syrup too goopy, sometimes I drain the syrup before I put the pecans back on the jelly roll pan for the second baking. If you like more heat or more cinnamon, by all means, up the amounts to 1/2 t.
I like to put them in an acetate bag and give away as hostess gifts. My friend Anne uses jam jars for her candied almonds. They are always appreciated by recipients. Copyright © 2015, Nazila Merati. All rights reserved.